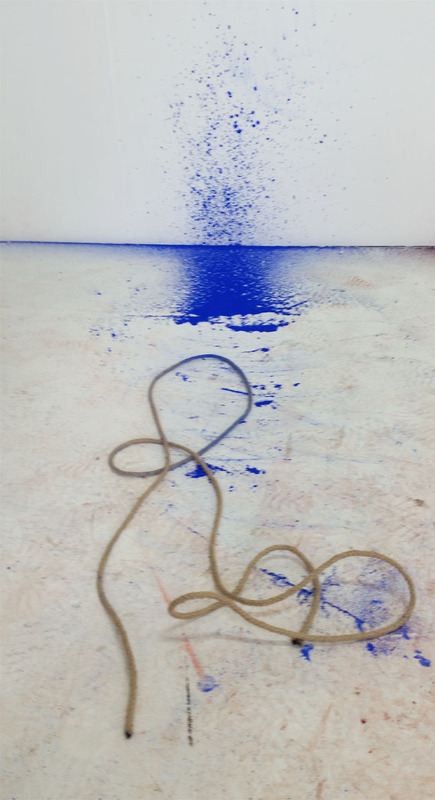 For Helen Goodwin and Terrence Brett materials form the initial starting point, they both use cobalt blue and red thread; Terry uses concrete which originates from the ground and comes in a powdered form; Helen uses earth and chalk, ground to a powder. We talk about the line...a line passing through a space; this leads to a line passing through a wall, from one space to another. We talk of the cultural use and significance of red thread. This leads to us deciding to attach it to us both, the line moving, drawing in space as we move in two separate spaces, the thread passing through a small whole in the wall. Helen Goodwin is interested in ideas that centre on what it is to define place and belonging. How inextricably bound do we become to the places in which/where we are born, live or travel to? She studied MA Drawing, Wimbledon College of Art (2013) Fine Art after obtaining a Postgraduate Scholarship, Budapest, Hungary, funded by the British Council and Hungarian Ministry of Culture and a BA (Hons) Fine Art, from Hull College of Art. Helen has a very international, site specific, often collaborative practice and has recently been involved in the following residencies and symposiums: Visit 14 – Smaland, Sweden (2014), Tokyo Wonder Site Programme, Tokyo, Japan (2012) and Mochi – Cross cultural collaboration with architects, designers, artists, poets, Tokyo, Japan (2012). She also exhibits, and group shows include Pop up Print Show – Art Lacuna, London, (2013) and Making Tracks – ONCA Gallery, Brighton (2013).